A Frenchman, Mr. Bouchier, later employed by the late Senator S.J. Crowe, built it. He died in the spring of 1931. From the street directories of the 1890s it appears that this may not have been the first occupied house on Davie Street, although it was undoubtedly one of the earliest, and from the picture above it was almost completely isolated. It looks as if it was completed in 1890 but was still vacant in 1891. By 1894 Mr F D Boucher (the correct name) was living there. Ferdinand Desire Boucher was born in Quebec and arrived in Vancouver in 1885. He was a carpenter, working at the Hastings Mill and in 1898 the Vancouver Sash and Door Company. He married Allia, (or that’s what the name looks like) another Québécois and in 1891 they had May, Gracie and Albertine Labrecque living with them, described as daughters-in-law but probably actually Ferdinand’s step-daughters. The 1901 census calls his wife Mary, and Albertius and Grace (now aged 22 and 24) are still at home. Remarkably, behind the added retail units of the Cotton Mouth Smoke Shop and Megabite Pizza the original structure gives every suggestion of still standing – one of the oldest building in the West End. In 1915 the house on the corner of Nelson and Burrard, 1001 Burrard, was owned by T Harvie, who made repairs the year before (although the street directory records the occupant as Thomas Harvey). 1003 Burrard was occupied by the First Baptist Church (who had the church on the other side of Nelson Street). 1005 Burrard was the home of Oscar P Ziegler, a violin teacher. A group known as the ‘Spare Time Symphony’ conducted by Oscar Ziegler, was playing in the city in 1915 but was disbanded after his death ca 1919. Andrew J Drewrey was at 1007 and 1009 was occupied by Alex Adam at the front of the house and Alex Crawford, a carpenter was at the back. 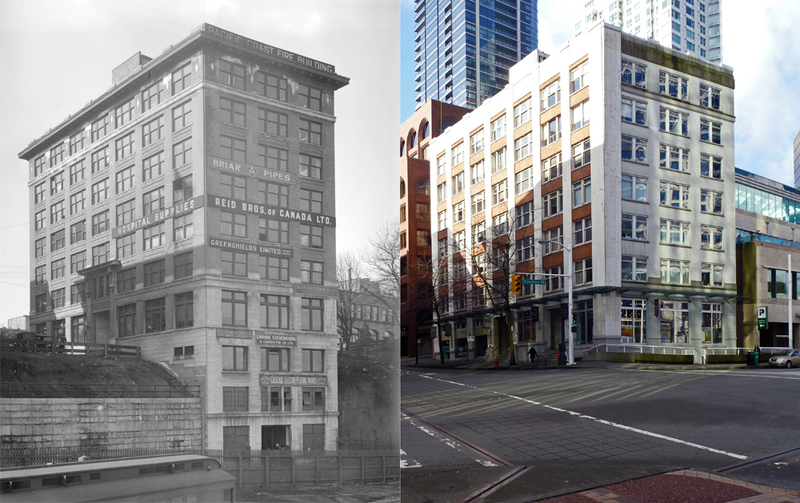 That year Mr Crawford designed and carried out repairs to 1007 Burrard for its owner, recorded as T Harrie or maybe Harvie – the clerk had a cramped cursive style that makes definitive identification difficult. In 1909 the same house (1009) had been repaired by J R Sharp for its owner T Harvey – so presumably the same person who was living at 1001 in 1915. It’s seems likely that all the homes were owned by the same person, Thomas Harvie, and his name was recorded by the building permit clerk as Harvey and Harrie. His name seems to have been spelled both as Harvie and Harvey between 1901 and 1915. These five houses were not the first buildings on the lot. In the 1901 insurance map there’s a single, larger house shown facing Nelson Street. It was standing in 1896 but vacant and in 1897 occupied by Daniel McIntyre, lumberman. It was erected and demolished (or maybe moved) in a very short time frame; in 1905 it is still standing, and Abbie McIntyre, the widow of Daniel McIntyre is living there. Daniel was aged 44 in 1891, and Abbie aged 40 and they were resident in Cowichan North. Daniel was from Ontario and Abbie from the USA and he was listed as a saw-mill owner. The family had obviously previously been in the US as Fred (22), Arthur (14) and Harry (11) were all born there. A year later in 1906 the Nelson Street address no longer exists. Instead the Burrard addresses have appeared; 1005 is listed as a new building, 1007 has Thomas Harvie, manager and 1009 Joseph Clark, warehouseman. In 1912 Thomas Harvie is identified as Manager of the BC Box Factory (which was on Front Street), and Andrew Harvie at the same address is a builder. Thomas Harvie was in the city in 1901, and according to the census he was living in household of four, headed by Ruth Galloway and her partner Alice Harvie. He was aged 38 and recorded as married, although there’s no sign of a Mrs Harvie. The fourth member of the household was Harvey Galloway, aged 28, listed as a lodger like Thomas. All four had been born in Ontario. It looks as if this 1901 household was recorded in a confused and inaccurate way, because the 1911 census shows Thomas Harvey, now aged 48, living at 1007 Burrard with his wife Alice aged 47 and their son Andrew aged 20. They also have a maid, Jessie Hillier. While Andrew had been born in Ontario, Alice and Thomas were shown as born in Quebec. Thomas was a box manufacturer, as was Andrew. There’s no sign of either Ruth or Harvey Galloway in 1911. In 1925 the houses are still standing, and A Harvie is living at 1003 1/2 (R Lackey was at 1003). In the late 1920s some of the houses are listed as vacant and Mrs A C Harvie is living at 1001 in 1929 and 1930. In 1931 1001 Burrard has gone, and St Andrews Wesley is under construction and by 1932 it was complete. The church was designed by Twizell and Twizell and was constructed from Nelson Island granite and Haddington Island stone. The style of the building was far from contemporary – it’s Gothic to look at, although it is actually of reinforced concrete construction with a stone skin. We’ve seen this building from a different angle. From this position it’s easy to see how much of the building has ‘disappeared’ from sight today – the street level today is three storeys above the ‘beach level’ below. If you look in the foreground you can see the expansion joints on what are really a series of bridges. If you walk up to the railing you can see in front of the building, you can look down the three floors that are still there. In 1920 when this image was taken the building was known as the Pacific Coast Fire Building, and was home to a wide variety of companies including the Pacific Coast Fire Insurance Company and Adkinson and Dill, contractors, who had built the Thomas Hooper designed building back in 1911. Greenshields were one of the tenants to get their name on the outside of the building. They had originally built a warehouse for their dry goods company on Water Street in 1902. The most intriguing company here was the Canada Witch Co who were in Room A (B R Harrison was company president), closely followed by B B B Co (Can) Ltd who were in Suite 401 where George Horton was manager. They weren’t the better business bureau, or the Bangkok Beer and Beverage Co, but a wholesale tobacco company. We’ve written in greater detail about the owner and developer of this building on another blog. Caroline Court is over a century old, being built in 1911 to J P Matheson’s design for James Pattullo by Dominion Construction at a cost of $150,000. It was built as a rental building, and it still fulfills that function today. The context it sits in has changed – the two houses to the north were replaced with a strata building, The Nelson in 1980. The Star Garage, seen in our 1939 VPL Leonard Frank image is these days another strata building, Kelvin Court, built in 1986 and designed by Robert Burgers. The tower beyond that is the rental building developed by St Andrews Wesley in 2002. The other large tower, behind Caroline Court, is the somewhat inaccurately named Heritage Court, dating back to 1971 and designed by Eng and Wright. In 1931 Dominion Construction built this 3 storey building on Homer Street. It’s a reinforced concrete structure, a technique Dominion were familiar with building. but it was the financial structure of the developer that was novel. While the recession hadn’t really bitten, Dominion’s boss, Charles Bentall, started to use the recently created New Building Finance Company to keep his construction workers employed. General Motors wanted a new building, but they wanted to lease it, and Dominion were the contractors and designers and were prepared to help finance the construction. When the time came, rather than the New Building Finance Company funding it the building ownership was taken on by the Selman family, owners of Canadian Wood Pulp and Tank Limited. Our photo shows the building a year after construction, and General Motors continued to occupy the building until 1950. They had offices for their finance division as well as their warehouse (presumably for parts). A couple of years later Barr and Anderson, plumbers, moved into the building, and at some point it became known as the Stall Building. Eighty years on the building looks remarkably similar to when it was built, but the occupants are quite different. Today the tenants, among others, are architects, a book publisher and a computer store. And somehow, (possibly during a 1986 renovation) while almost every building that had a fancy cornice has lost it, the Stall Building managed to acquire one it never had. 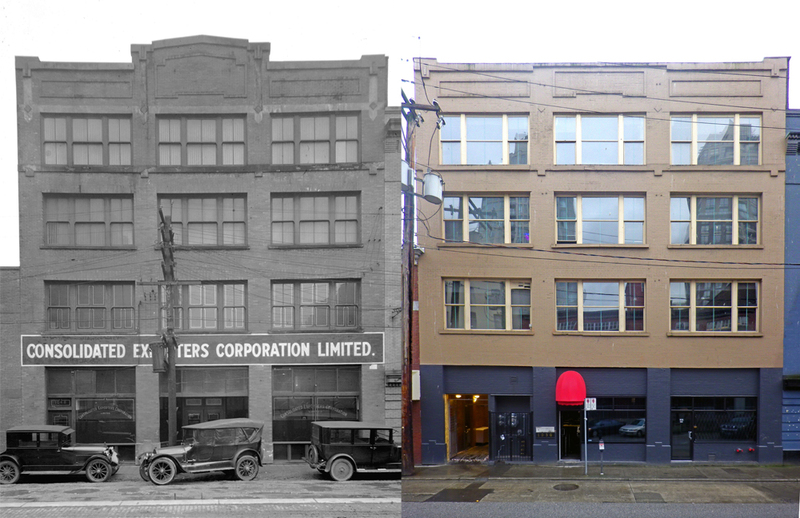 We now know a bit more about this Yaletown warehouse than has been recorded anywhere else. We know who designed it – it was Raphael A Nicolais, an architect about whom we can find very little information. Sometimes he partnered with Richard Perry, and his name was as often as not recorded as Nicolas, or as Nicholais, although we think it was most accurately (and mostly) written as Nicolais. Unlike some blog subjects, he can be found with his wife and family in the 1911 Census, living in Point Grey on the corner of 3rd Avenue and Trimble. There he was recorded as Ralph A Nikolias, he was only aged 28 and he was born in Italy, arriving in Canada in 1910. The builder was George Baker, and the owners were Buckley and Baker. They don’t seem to have ever built anything else, so are hard to track down. It seems most likely that Baker is the same George B Baker who built the Gray Block, and the most likely Buckley is Frank L Buckley who had a new house built on Osler Avenue in 1913. He was recorded in the street directory as Managing Director of the British Canadian Labour Corporation, a position he continued to hold over a number of years. We think he must have been the Frank Buckley who in 1911 was the American manager of B C Lumber Mills, and lived with his American wife Rosa and two children, James and Helen, and their Norwegian domestic, Bertha Ostrom. The building was built in 1911, and is recorded on the 1912 Insurance map as the King Warehouse when it was apparently numbered as 1050 Hamilton. In 1924, as our picture shows, it was used by the Consolidated Exporters Co. During the 1940s and 50s it was home to Crawford Storage, where Mrs M M Crawford was company president. More recently it continued to be a warehouse for clothing, but now operates predominantly as office space. The 5-storey warehouse on the corner of Homer and Nelson Street was owned, designed and built by R Bowman in 1909. There was a well-known Vancouver architect, Joseph H Bowman, but R Bowman was somebody else (and no relation, as far as we can tell). Heritage Vancouver have found the Vancouver Sun description of the development. In October, 1909 they reported that “A building permit was this morning taken out by Mr. R. Bowman for a five-story block located on the southeast corner of Nelson and Homer streets, the site having been recently acquired from the C.P.R. The building will be of brick construction throughout, and is designed for warehouse and factory purposes. It is understood that before it was planned a ten-year lease of the premises was made to representatives of a local industry which will employ 50 hands as soon as operations are started“. The ‘local industry’ mentioned in the article was the Vancouver based Bogardus Wickens & Begg Glass Company (formerly the B.C. Plate Glass Importing Company). In 1901 Richard Bowman’s Trade or Occupation is described in the census return as storekeeper and the 1911 Street Directory clarifies that he was storekeeper for the CPR shops. However, in 1911, the single word entry for Mr Bowman’s occupation says ‘Income’ and the 1912 Directory (which reflects what he was doing in 1911) refers to him as a commercial agent. He arrived in Canada from England either in 1875 or 1881 (the two census records show different dates). By 1901 He had a wife, Nancy (who had also been born in England but arrived before Richard either in 1866 when she was only aged four or 1870 when she would have been eight. ), Their son, Oscar, is listed as being born in Ontario in the 1901 Census, and England in 1911, and was born in either 1883 or 1886. As far as the 1911 census is concerned he had not arrived in Canada (as an immigrant at least) until 1907 although he was living with his parents in Vancouver in 1901. James H Bowman, Richard’s nephew, was also living with the family in 1901. The Bowman family lived in a turreted house at 1101 Harwood before moving to Osler. We don’t know if Mr Bowman really designed the building. F H Rayner was architect for the added floors on Bowman’s warehouse on Beatty Street, and a house for him on Osler Avenue, but that was in 1913. He only has one other building listed, also in 1913, so he probably wasn’t in Vancouver in 1909. Richard Bowman’s son, Oscar and his nephew, James were shown running Bowman Storage by 1911, but Oscar died in 1923, and in the 1920 US Census Richard and Nancy Bowman were living in Long Beach, California. Richard died in Vancouver in 1926 and Oscar’s widow, Beatrice, ran the company from 1926 to her death in 1941. Beatrice married Oscar in 1913 and became bookkeeper for the Bowman company. At some point – apparently quite early in its history – the building added office uses to the upper floors. While today there is a Shoppers Dug Mart on the main floor and a TD Bank beneath it, in the early 1950s it was the Canada Cycle & Motor Co. Today there are a number of office users upstairs, including several mining exploration companies, acupuncture, aromatherapy and a yoga studio. In 1952 it was the Canadian Mercantile Insurance Co, the Commerce Mutual Insurance Co and C R Padget’s real estate office.